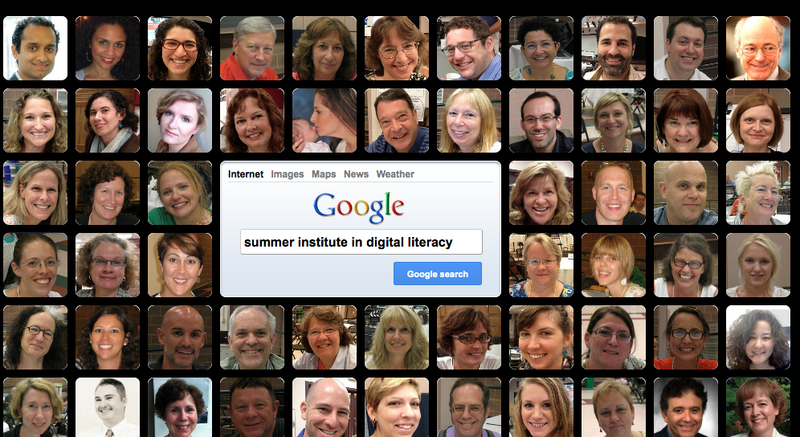 The First Summer Institute on Digital Literacy was held July 14 - 19, 2013. Watch and share this video to learn more about why this event is the premiere professional development program for K12 and college educators, librarians and media professionals. 70% of participants rated it the BEST professional development program they have ever experienced in their entire career! "The most beneficial element of the Institute was getting to hear from so many leaders in the field, in one place. I think that so many times, leaders hold separate conferences and it was outstanding to see the minds of today come together and generate a space for learning and growing." "I benefited most from the deep ways in which the use of digital tools was embedded in thinking about classroom practice, educational research and theory, etc. The tools were not the focus." "I think the most beneficial elements of the institute were the opportunities to share and collaborate." "I benefited greatly from the large variety of tools that were modeled--- both by the workshop presenters and by my peers. Moreover, the collegiality that I was able to establish gave me the comfort to take risks and ask questions about Tools with which I did not have comfort. The floating leaders really were of great benefit, too, as it seemed that there was always someone there whom I could ask a question." "Networking, the creativity and shared knowledge base." "This was an amazing opportunity to work with 50+ other people who GET what I do and what I care about! One of the most relevant experiences I've had in PD." SAVE THE DATE for July 13 - 18, 2014. See why we're having fun! Follow us on Twitter at #digiURI to see what we're learning with K-12, college educators, librarians and youth media specialists. Watch these 1-minute videos to learn about our our talented team. Wondering why you should participate? Read this press release. Overview. This six-day institute focuses on how literacy is changing as a result of emerging media and technologies. We'll consider the implications of this cultural and technological shift for teaching and learning at all levels. Join us in exploring innovative approaches now being used by K-12 educators, librarians, and college and university faculty, both in and out of the classroom. You will learn how to conduct project-based inquiry using a variety of digital texts, tools and technologies, which will help create challenging and engaging learning opportunities for you and your students. Dates: Sunday, July 14 - Friday, July 19, 8:30 - 5 p.m. Registration Fee: $600. Includes program materials, opening reception, daily refreshments, and one ticket to the gala dinner. Bring a Co-Worker. To promote collaboration, participants are encouraged to register with a colleague. Two participants from the same organization pay $1000 (a cost-saving of $100 on tuition). Earn 3 Graduate Credits (Optional): Non-URI students, pay $990 to enroll in EDC 586: Problems in Education: Special Topics. URI Graduate Students earn credit for a flat tuition fee of $990. Participants who decide to earn graduate course credit will complete two additional assignments before and after the Summer Institute. URI Faculty and Staff. Pay $150 registration fee only. Spaces are limited, so register early. It is the emergence of mass media which makes possible the use of propaganda techniques on a societal scale.